In the month of May 2014, two young sisters from Katra Sahadatgunj village of Badaun district of India's Uttar Pradesh state had gone out at night to attend the call of nature. They however never returned back. Their dead bodies were found next morning hanging from a nearby tree. The gruesome murder of these two young girls was something that suddenly made India acutely aware of one of the most basic and fundamental problems faced by the country, that the absence of a toilet in a house was one of the principal reasons for incidents of rapes and sexual assaults in villages. 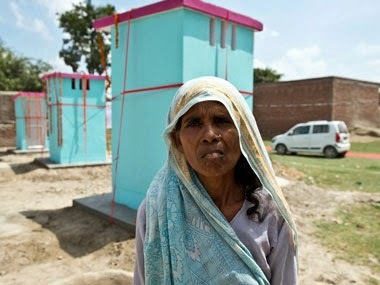 According to UN figures, out of India’s 1.2 billion population, only 665 million have access to toilets. In fact it is quite ironical that a UN study in 2010 finds that more people in India have access to a mobile phone than to a toilet. This study says that lack of toilets and proper sanitation costs India nearly $54 billion a year through hygiene-related illnesses, lost productivity and other factors. In most of the states of India, the situation continues to be absolutely grim and disastrous. In the state of Uttar Pradesh, almost 10 % of the population is an easy pray for deadly diseases because of lack of individual and personal hygiene. Out of total 0.6 Million villages of India, only 25000 villages have toilets available for all the village dwellers. Non maintenance of personal hygiene is the primary reason for the unhealthiness of the society of India at large. About 0.4 Million Indians suffer from Diarrhea every year. Out of which almost 90% are small children. India gets an hit of 2.4 Trillion Rupees, which is 6.4 % of the GDP, because of this personal unhealthiness. Indian Government spends 100 Billion Rupees on Rural development. Out of this only 2 Billion Rupees are spent of programmes connected with personal Hygeine and Toilets. Just because there are no toilets available within their premises, many Indian womenfolk from villages are forced to to go out in groups to defecate in open spaces in darkness before the dawn breaks. These women find this a very shameful act, which they have to perform every morning. This lack of freedom even to carry out normal needs of a human body makes big impact on psychology of these village womenfolk. A low-cost sanitation NGO from India that specializes in building low cost toilets; Sulabh International, decided to adopt this village in June 2014 in memory of the two girls. They conducted a survey and found that nearly 400 families in the village do not have proper toilets and decided to launch a campaign “toilet for every house.” Now, after just two months, Sulabh has dedicated 108 toilets decorated with marigolds and ribbons to the village, which has a population of 4,000 people, so no one has to wait for darkness to fall to attend the call of nature in the open. In the grim scenario, there is reason for some hope. Women from the Indian state of Haryana , now seem to have taken a new lead. With rural womenfolk, giving their support to the cause, the movement appears to have caught the fascination of the village women in the state. If you ask a rural young girl in Haryana state today, about her expectations of her future bride groom, along with such usual expectations, such as being vegetarian, no vices, capable of getting a good job, a new expectation is likely to be expressed. Most of the girls would say that the future groom must have a latrine in his house. Two years back, Government of Haryana with the help of few NGO’s, started a new movement under the slogan, “No Toilets, No bride”. This movement has caught the fascination of rural womenfolk and is growing rapidly. 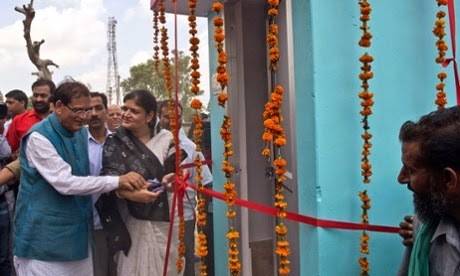 Sulabh International has developed a toilet suitable for villages. What is needed is a massive public relations effort to make the village folk see the light at the end of the tunnel, which not only would improve the personal health but will also protect the young girls.